New Delhi: Nandan Nilekani, normally unflappable, lost his cool when he was asked in an interview why he was becoming an author. What do you have left to prove? Are you playing at being an author? “What do you mean?" Nilekani, co-founder and co-chairman of software maker Infosys Technologies Ltd, had retorted in the interview he gave for a profile published in the 2 August edition of Lounge. “I have worked hard on this. Every single idea in that book is mine. I am going out on a limb here; opening myself up to criticism; people I don’t know can take potshots at me." Nilekani’s much anticipated book, Imagining India: Ideas for the New Century, will be launched on 24 November in New Delhi, and in his hometown Bangalore three days later, followed by other Indian cities, including Mumbai, Chennai, Kolkata and Hyderabad. The book will also be released in the US and elsewhere in 2009. Imagining India will also mark the India debut of Penguin Books Ltd’s non-fiction imprint Allen Lane, named after the publisher’s founder. The list of authors published under the label include economists Amartya Sen, Thomas Friedman and Joseph Stiglitz; journalist Malcolm Gladwell, American film-maker Michael Moore and biologist Richard Dawkins. “It’s a definitive book on India," says Penguin Books’ India managing editor Udayan Mitra on Nilekani’s debut offering. “It’s the kind of book that has an international appeal. 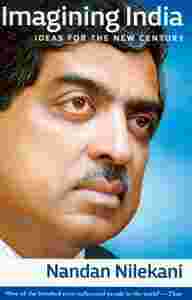 Nilekani has been in the forefront of IT revolution in India and is one of the most recognized faces globally". Imagining India is divided into four parts: The first dwells on topics, including globalization, India’s demographic advantage, the changing role of the entrepreneur and technology. The second is about the infrastructural challenges and the third looks at issues such as conflicting political ideologies, labour reform and higher education. The last section deals with democracy and technology, health, pensions and entitlements, the environment and energy. “There is a slew of books on India’s future that make Indians feel good; they inculcate an air of self-congratulation," said historian-author Ramachandra Guha, a longtime friend of Nilekani, who was one of the first to see a draft of the book. “Nandan’s book makes you think and introspect about India’s future." “It is a very well-written, carefully argued book," Guha added. “He has accurately identified the problems and faultlines, and suggested solutions. Of course, anyone reading it won’t agree with it 100%, but will (nevertheless) be stimulated, provoked and informed." Guha said he himself doesn’t share Nilekani’s optimism because “by temperament, I am more sceptical" as historians usually tend to be. Penguin is betting big on Imagining India. Though the publisher isn’t disclosing the precise number of copies it is printing, the book will have the biggest print run this year for a book by the publisher, says Mitra. The last biggest print for Penguin this year has been 25,000 copies, but Mitra declined to name the book. In the next nine months, the Allen Lane imprint’s line-up in India will include former presidents A.P.J. Abdul Kalam and K.R. Narayanan, Infosys co-founder and chief mentor N.R. Narayana Murthy and author-activist Arundhati Roy. Other non-fiction imprints available in India include Little, Brown and Co. and Weidenfeld and Nicolson from Hachette, Knopf from Random House and Fourth Estate from HarperCollins Publishers. “Imprint strategy is a recent thing in India and it’s to be seen how many imprints can be spun out successfully here," says Thomas Abraham, managing director, Hachette India, part of Paris-based publishing group Hachette Livre SA. Imprints help publishers focus on a “particular genre and certain kinds of books", says Yogesh Sharma, general manager for sales and operations at HarperCollins Publishers India Ltd. “But at the end of the day, it is the author which really matters", Sharma says, adding: “Readers really do not care who publishes (pulp fiction author) Sidney Sheldon." Penguin plans to put a major effort into promoting Imagining India over the next several months, including a six-city tour by Nilekani, tie-ups with mobile service providers and a website (www.imaginingindia.com) to engage readers in a discussion on India. It also plans a separate marketing strategy for academic institutions and says it is in talks with a coffee chain for specifically reaching out to young people.